Having light and fluffy quinoa on hand makes healthy eating that much easier. 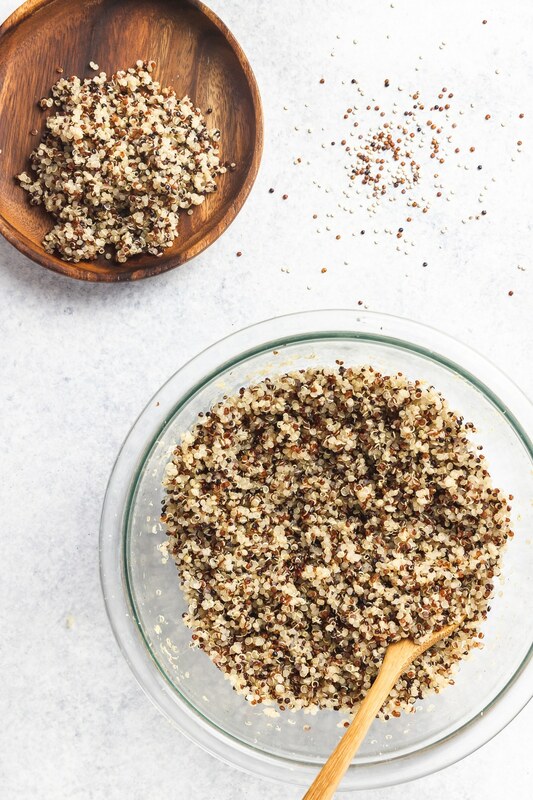 Here are three easy ways to cook quinoa, so you can choose your own adventure! There is not one perfect way to do anything. This took me a long time to figure out. Honestly, I’m still figuring it out. In blogging, in the kitchen, in relationships, in fitness, and just in life in general. It’s easy to latch onto the idea that this or that will be THE thing that really makes a difference – the one thing that solves all the problems. But of course, anyone who has lived even a little bit of life understands that that’s not how it shakes out most of the time. Lately I feel like life is more like a constant state of trial and error. Try a thing, make observations about how it turns out, tweak, go back to the drawing board if necessary, try another thing. That’s how recipe testing goes for me most days. And to be honest, I could test and re-test a recipe a dozen or more times before I could ever say it was “perfect” because that’s such a loaded word. Perfect for me maybe, and even then, perfect for me in that moment, on that day, for whatever particular mood I was in. So I’ve kind of let go of the idea of perfect, because why try to find the one solution, when you can find the many. 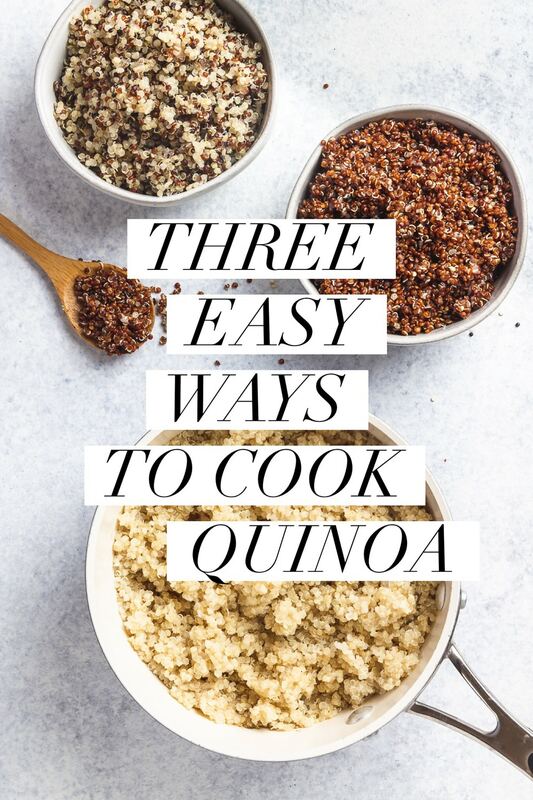 So today I’m sharing three ways to cook quinoa that I hope will make your life a little easier. I’ve used all three of these methods in my own kitchen on numerous occasions. I wouldn’t call one my favorite or even the best. But all three work beautifully and result in light and fluffy quinoa that is great for your Sunday meal prep. So try them all, and see what works for you. This is the method that’s probably the most familiar, but also the one that gives people the most grief. Mostly, this is because it’s dependent upon not only timing, but ratios of quinoa to water. 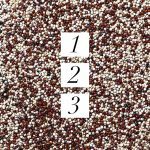 Even if you’ve never cooked quinoa, you’ll probably recognize these as the same steps you might use to cook rice. However, quinoa is much more forgiving a grain, so this is definitely easier. First things first, always start by rinsing your quinoa. This washes away the natural coating of saponin found on quinoa, which while harmless, can make the stuff taste a little soapy. Now bring two cups of water to a boil (for every 1 cup of uncooked quinoa). Add a heavy pinch of salt and then add your quinoa. Turn the heat down to a bare simmer, cover with a kitchen towel and then follow with a tight fitting lid. No lid? Use an oven proof dinner plate instead – but be careful when you remove it, because it will be quite hot. Then set a timer for 12 minutes letting the quinoa steam over low heat. When your timer buzzes, DON’T open the lid. Just turn off the heat, move the pot to a cool burner, and let it sit for at least 10 minutes. I often cook my quinoa and just let it hang out on the back of the stove while I prepare the rest of whatever I’m making, and have found that it keeps just fine for at least 30 minutes. Then uncover, fluff with a fork (which separates the grains – for those like me who never really understood that direction), and serve. This method is the one I use most often, because it involves the least amount of precision. It’s called the pasta method because you cook the quinoa just like pasta. Bring a big pot of water to a rolling boil (you want to have at least four times more water than quinoa). Salt it pretty aggressively, like you would for pasta. Add in your rinsed quinoa and boil for 14 minutes. When your timer goes off, drain your quinoa in a fine mesh sieve (or a colander lined with some paper towels), and transfer it back into the pot. Cover the pot with a tight fitting lid and let that sit, off heat, for 10 minutes. Can you cook quinoa in the microwave? Heck yes. This method is effectively the same as the stove top method, which uses water to steam the quinoa, except it’s all happening in your microwave! The only tricky thing about this method is that all microwaves are a little different. So this one may take just a bit of trial and error on your part before it becomes old hat. 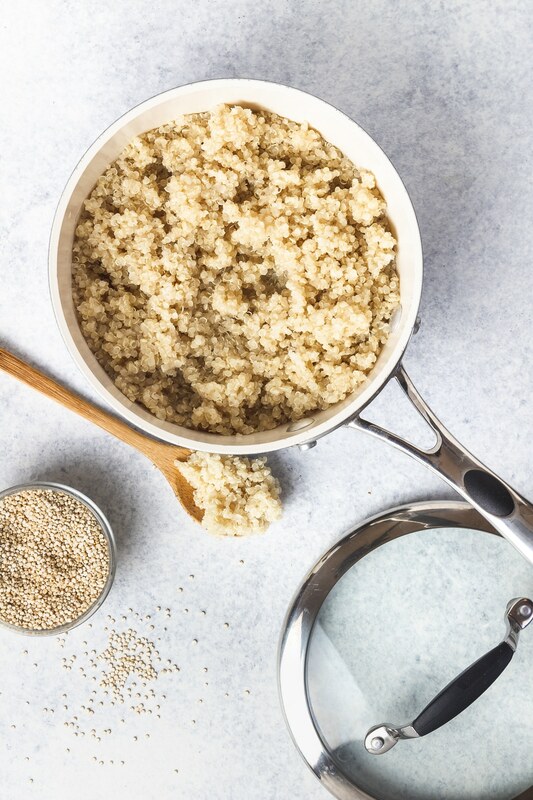 Add two cups of water and a pinch of salt to one cup of rinsed quinoa in a large, microwave safe bowl. Cover with plastic wrap (or a microwave safe plate) and cook on high for five minutes. Uncover, stir, recover, and microwave at 80% power for six to eight minutes or until all of the water is absorbed. Then, you guessed it – let it sit in the microwave, covered, for 10 minutes. Hey Jo, can I really put plastic wrap in the microwave? Yes, you totally can. Plastic wrap is completely microwave safe, so long as it’s not actually touching your food. However, if the thought of microwaving plastic wrap squidges you out, go ahead and use a dinner plate, or one of those reusable silicone plate covers instead. 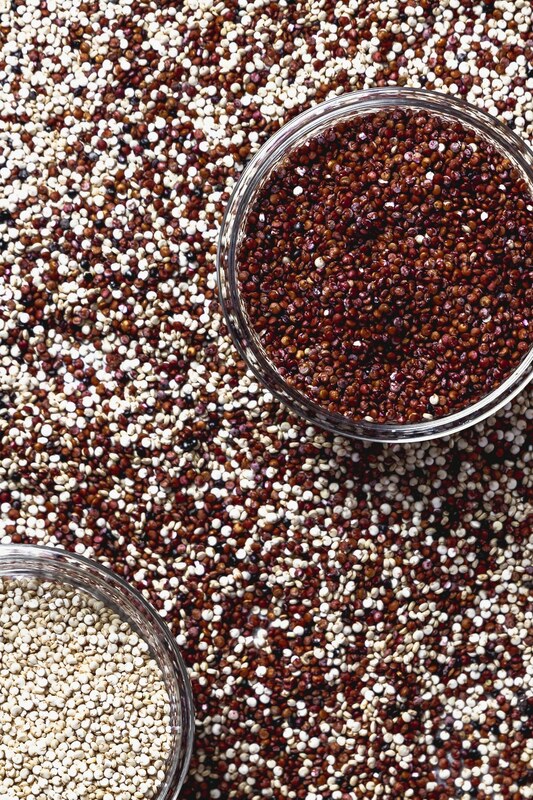 Which quinoa is best for you? Any way you slice it, quinoa is good for you (I mean maybe not if you cover it in cheese and serve it with fried chicken and ice cream sundaes – but that sounds pretty freaking good). There are slight differences between varieties. But in general they all have similar protein content, fiber, calories, nutritional benefits, and all three are naturally gluten free. In general the lighter the color the less fiber-dense the quinoa will be. But the disparity is not wide, so I’d go with whatever you like the best, because if you don’t like it, you probably won’t eat it. 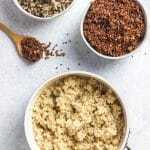 Do different varieties of quinoa taste different? The short answer is yes. Of the three varieties that are most commonly found in the US (white, red, and black), white is the mildest and fluffiest. Think of it as gateway quinoa. Red (which really looks more brown once it’s cooked) is a little sturdier in texture and nuttier in flavor (and my personal favorite). Black quinoa is usually hard to find on its own. 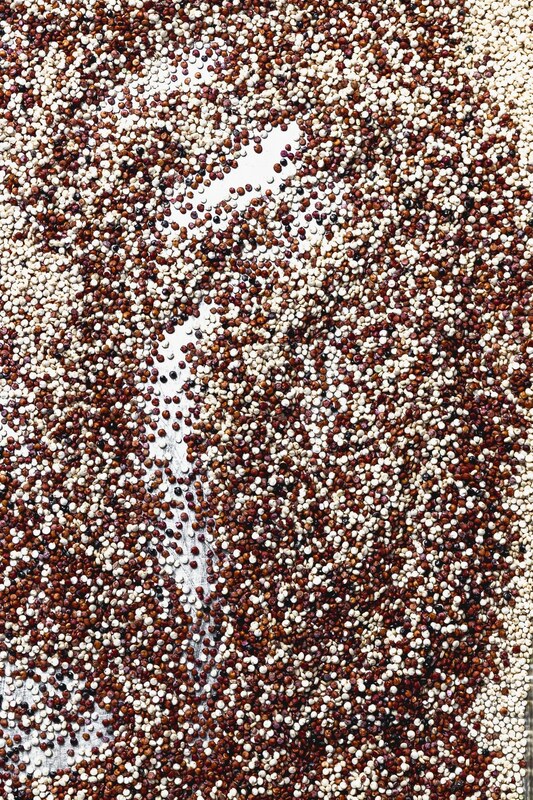 I see it most often in quinoa mixes, like the Trader Joes tri-color quinoa. Its flavor is definitely the strongest, and is usually sweeter than white or red varieties. How long does quinoa keep? I’m not a meal prep maven by any means but I can usually muster the Sunday afternoon energy to boil up some quinoa and throw it in the fridge. Quinoa, fully cooked and stored in an airtight container will keep in the fridge for about a week, and in the freezer for up to 6 months. 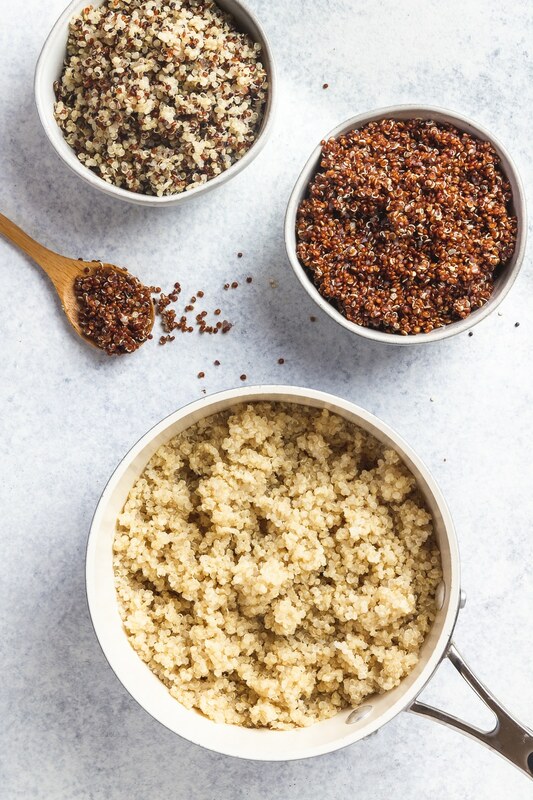 What can I use cooked quinoa in? Fold it into homemade veggie burgers or turn it into quinoa breakfast porridge. You can toss it into salads like this Strawberry and Spinach one from Abby at Heart of a Baker did or even give chocolate chip cookies a boost of protein. It’s great in overnight oats, vegetarian chili, stuffed into peppers, or how about putting a spin on Taco Tuesday like Haylie at Our Balanced Bowl did with this Turkey Taco Quinoa Skillet. And of course it’s great as an alternative to your usual rice or potato side. I like mine alongside this slow roasted salmon with pistachio pesto. So to sum it up, quinoa is great and you should be eating it if you aren’t already. I’m not sure if I know the absolute, hands down, best way above all others, to cook quinoa, but I do know that just like life there are many different approaches, and if you find one that works for you, you’re pretty golden. If you like this kind of how to and want more of it, go ahead and click subscribe. 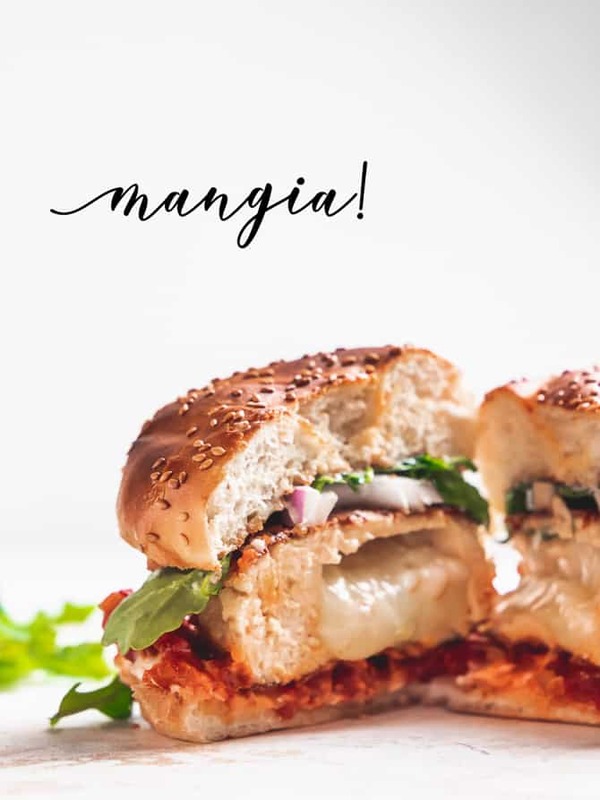 You’ll get lots of helpful tips, tricks, and exclusive recipes just for being on the list, and they’re delivered straight to your inbox! Quinoa is good for you, delicious, and easy to make. Learn three ways to cook quinoa and take your meal prep to the next level. Now bring two cups of water to a boil (for every 1 cup of uncooked quinoa). Add a heavy pinch of salt and then add your quinoa. Turn the heat down to a bare simmer, cover with a kitchen towel and then follow with a tight fitting lid. Set a timer for 12 minutes letting the quinoa steam over low heat. When your timer buzzes, DON’T open the lid. Just turn off the heat, move the pot to a cool burner, and let it sit for at least 10 minutes. Uncover, fluff with a fork, and serve. Bring a big pot of water to a rolling boil (you want to have at least four times more water than quinoa). Salt it pretty aggressively, like you would for pasta. Add in your rinsed quinoa and boil for 14 minutes. When your timer goes off, drain your quinoa in a fine mesh sieve (or a colander lined with some paper towels), and transfer it back into the pot. Cover the pot with a tight fitting lid and let it sit, off heat, for 10 minutes. 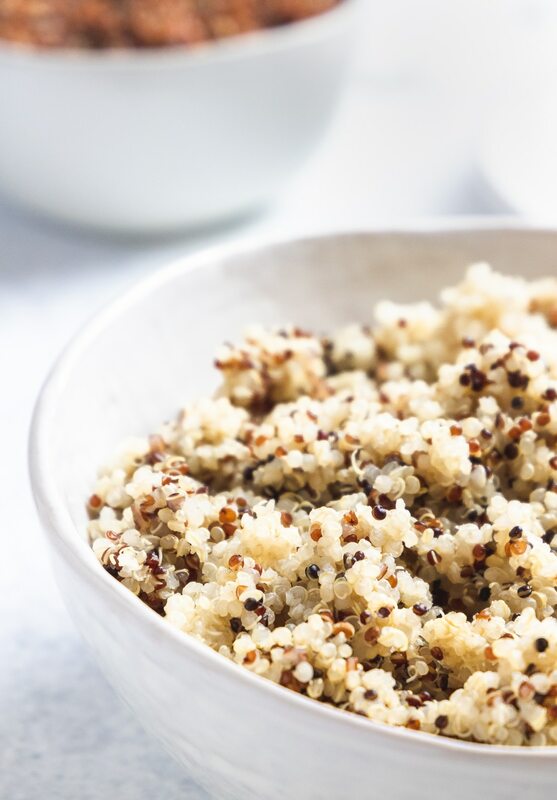 Add two cups of water and a pinch of salt to one cup of rinsed quinoa in a large, microwave safe bowl. Cover with plastic wrap (or a microwave safe plate) and cook on high for five minutes. Uncover, stir, recover, and microwave at 80% power for six to eight minutes or until all of the water is absorbed. Let it sit, covered, for 10 minutes. Always give your quinoa a quick rinse before cooking, to get rid of the outer coating of saponin which while harmless, can make it taste bitter. 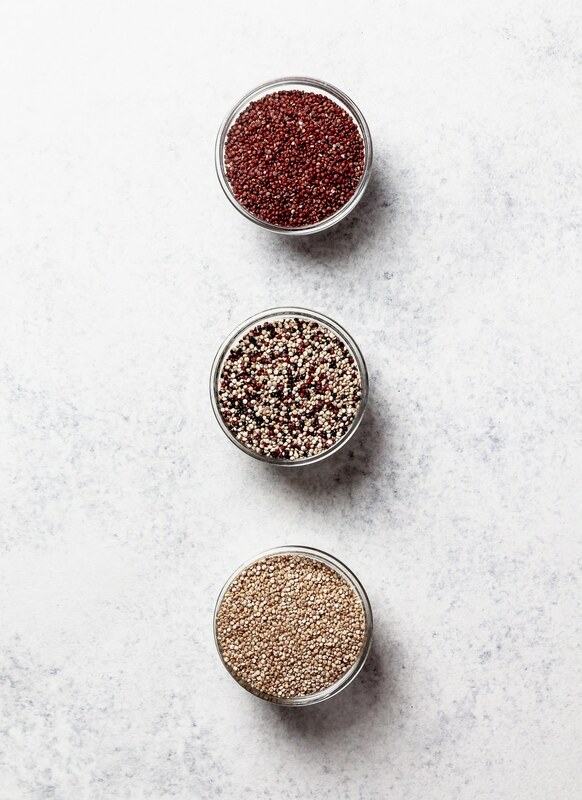 Cooked quinoa can be stored in an airtight container in the fridge for a week and in the freezer for up to 6 months.